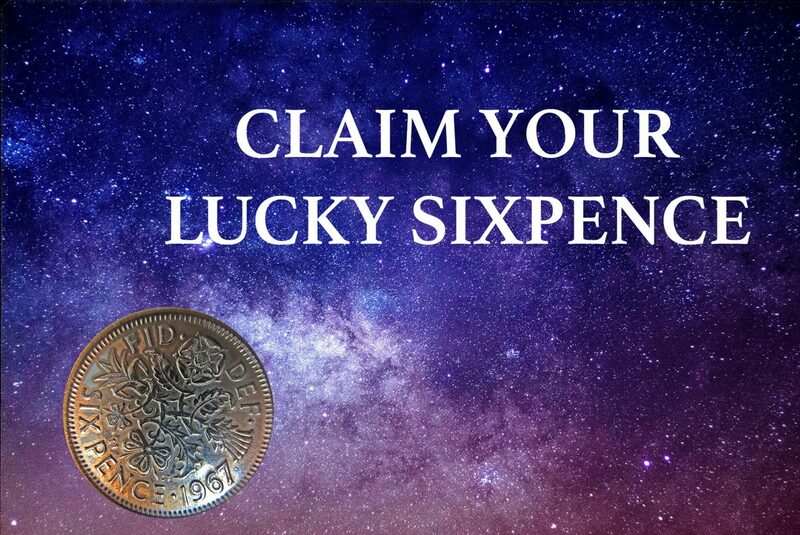 Make Your Wishes Come True With A Lucky Sixpence! A magical hello to you! We all need extra protection around us in our daily lives, especially with the turmoil in the world at present. I believe that there is a need to create positive energy and happiness to help bring balance back into our lives. A lucky silver sixpence could bring the extra protection you need, as well as helping to make your wishes come true. Create Abundance: Traditionally speaking anyone seeking good fortune should bow to the New Moon and turn over any silver coins in their pockets three times, over the days ahead as the Moon “increases” in size, so too will your bank balance. Being without money at the time of the New Moon is thought to be unlucky, so it is important that you always carry your Wishing Moon Sixpence to ensure that you will have plenty of money over the month ahead, and the wish that’s made while turning the coins will be fulfilled. Generate Happiness, Love and Protection: Silver, being the colour that resonates to the Moon and to the Angelic realm is the first symbolism of the sixpence. If you look closely at the coin you will see other symbols, a garland of roses (love and romance, happiness, friendship), thistle (protection, strength and good health), shamrock (good luck and success), and leek (clairvoyance or clear sight “to see the truth” ”know thy enemy”). The words “Fid Def” are also on the back of the sixpence. This is Latin for fidei desfensor, or defender of the faith. Bring Luck. Wishing on the Full Moon will cover ALL wishes not just money. Also I find being actually able to see the Moon in all her beauty, magnifies the magical energies needed to ensure our wishes are granted, as opposed to the New Moon which cannot be seen and so requires far more imagination on our parts because she is not as visible to us. When we dedicate the sixpence to our hearts, it changes in psychic form, from being a lucky charm into a far more powerful personal talisman. Used only to attract good things into the owners life whilst ensuring we are protected from all negative energies. On a night when you can see the Moon is full, go outside; hold out your right arm with your sixpence placed on your open flat palm. You can repeat the ritual at every Full Moon or you can simply turn the sixpence in your pocket and say, MY WISH IS GRANTED. Want your very own lucky silver sixpence? You can claim a magical Wishing Moon sixpence by emailing angel@wishingmoon.com with your postage address. UK residents only, until 31st May 2016. Cynthia, you need to send us your address to angel@wishingmoon.com before we can send you a lucky sixpence.